Long walks on the beach have an almost mystical image for us, and sea glass collected during those strolls evoke a feeling of freedom, warm sea breeze, and the pure delight of summer relaxation. But most of us don’t live anywhere near a beach. And sea glass collecting endeavors seldom yield the bright treasures we hope for. But that doesn’t mean you can’t have the sea glass of your dreams. Faux sea glass is easily made with translucent polymer clay. Once you start thinking of all the cool things you can make with faux sea glass, you’ll want to dig out your copy of my Faux Glass Effects Tutorial, grab some packages of Pardo Translucent, and get busy. I was really eager to spend time in my studio last week (and really needed some new jewelry for summer outfits), so I’ve included pictures of the pieces I made. Like I said, sea glass means summer. Sea glass is gorgeous, so it’s only natural to want to make jewelry with it. But real sea glass is also heavy. Small pieces can be used as an accent, but if you use very much in a necklace or earrings, they’ll be too heavy to wear. It’s no fun to bend over to pick something up and have your heavy glass pendant swing forward and smack you in the face. Ouch. Polymer clay faux sea glass is much lighter and easier to wear. Polymer clay is also much easier to drill than real sea glass. 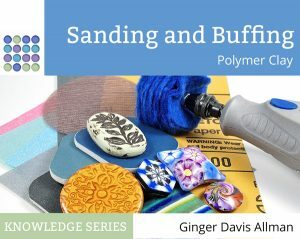 You can easily use a hand drill, a Dremel, or even pierce the pieces before baking with bead pins. I drilled all the pieces in this article after baking, even the ones that are drilled lengthwise. Try that with real sea glass! When using real sea glass, you are limited to the sizes, shapes and colors that you collect. It would be nearly impossible to create a large necklace with uniform sizes or get matching pairs to make earrings from authentic sea glass. 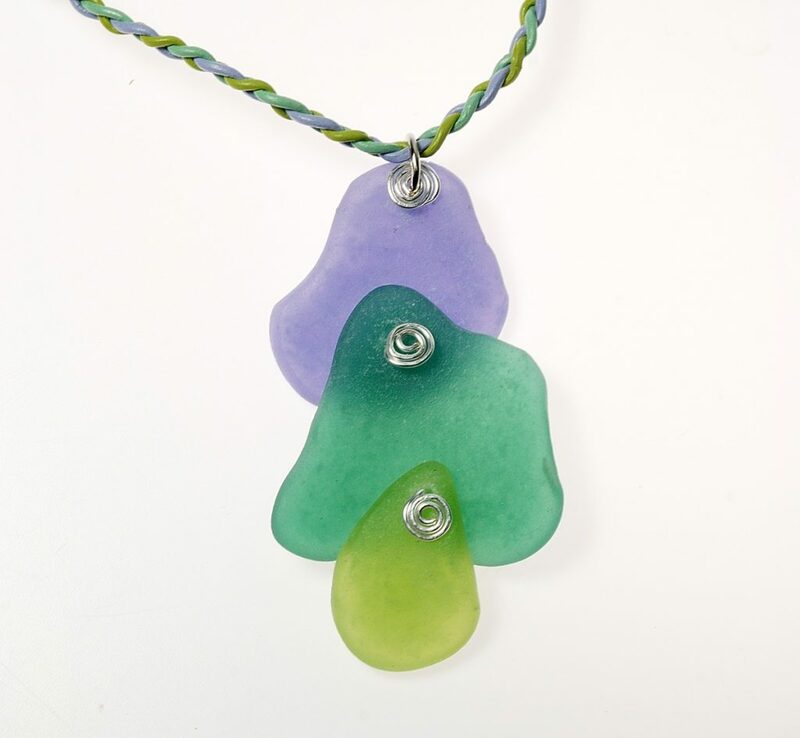 When you use polymer clay to make faux sea glass jewelry, you can make exactly what you need for your design. Authentic sea glass comes in limited colors. Some colors, such as red and yellow, are so rare that you’d never find them in lifetime of beachcombing. But with polymer clay faux sea glass, you’ll be able to make any color that you can dream. You can even make colors that don’t really exist in glass, such as hot pink and bright purple. Is Faux Sea Glass Convincing? Polymer clay is wonderful for creating faux effects, but can you really make convincing sea glass? You tell me. All of the jewelry pictures on this page are polymer clay. Notice how light comes right through them? Seriously, you can’t really tell until you pick them up that they’re plastic. Is it easy to make faux sea glass with polymer clay? Yes, it is. And there are quite a few ways to do it. The clear, complete instructions in my Faux Glass Effects Tutorial give excellent results and it’s just one of five different faux glass types that I teach you to make in the 70 page tutorial. But there are also excellent tutorials out there by Cynthia Tinapple, Tina Holden, and Randee Ketzel. What if you’re not into making sea glass jewelry? There are many, many other things that you can make with sea glass, including home decor, gifts, and even wedding favors. Who doesn’t love a scattering of sea glass and shells as a table centerpiece? If you’re looking for more cool ways to use the faux sea glass that you make, here’s a Pinterest board full of inspiration. If you’ve already bought the Faux Glass Tutorial and made your own version of faux sea glass, or if you’re just now doing it, please send me pictures of what you make! I am gathering photos to create a customer gallery here on this website. I’ve invested in a new facility that will show off your photos and allow others to be inspired by what you make. Feel free to send me photos by email or on Facebook. Thank you! I just purchased your ‘Faux-Glass-Effects-Tutorial’ book and already – just on page 5 I found out why a piece I tried to make with Pardo didn’t look translucent like yours. Your book is THE BEST! I am brand new to polymer clay for jewelry-making and can’t believe I was lucky enough to stumble across your website! You are a walking encyclopedia when it comes to clay. I also bought the ‘Getting up to Speed’ and your ‘Sanding an Buffing’ Books. What a blessing you are to this part of the art world. Keep up the wonderful work!